I realize it’s St. Patricks Day and yes. I’m Scots-Irish (on the Presbyterian side). I just don’t do the St. Patty’s Day thing. I like my beer, Guiness included, although I personally prefer Wexford Irish Cream Ale. I like corn beef & cabbage, which, by the way, isn’t really Irish. Nor is the Reuben sandwich (originating in Omaha, Neb) which many people eat on St. Patty’s Day because it has corn beef. Sheesh! I also don’t run around with a “Kiss Me I’m Irish” T-Shirt on this hallowed day. So, forgive me if this post isn’t about stereotypical Irish nonsense. Instead, we are having remarkable weather in DFW. 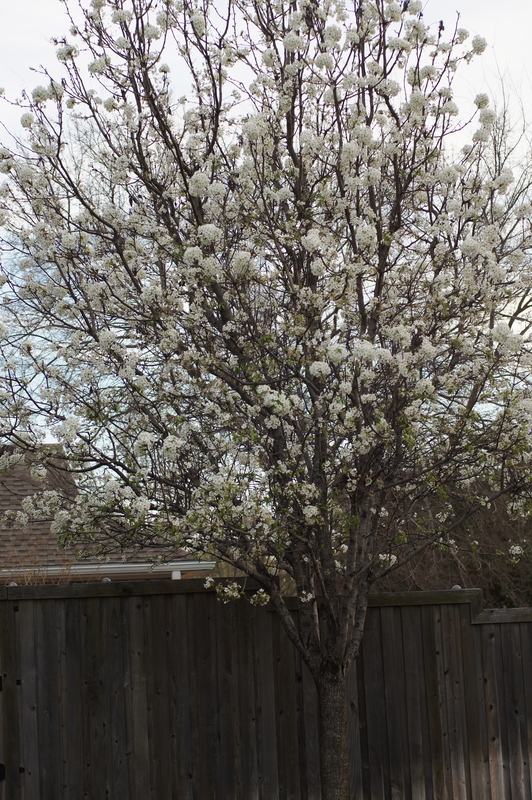 Yesterday it was 80 F and my pear tree is in full bloom. How can you not grill when it’s 80 F and beautiful, blue, sunny skies? This is perfect grilling weather! At least I put a little green on the dish to assuage the concerns of my non Irish brethren. I have repeatedly pointed out we have had a remarkably warm yet unusual winter in DFW. We had only 1 real cold snap and it was very short lived. Yet we had wide temperature swings. You never knew whether to prepare for warm weather or brace for the Northern that never hit. 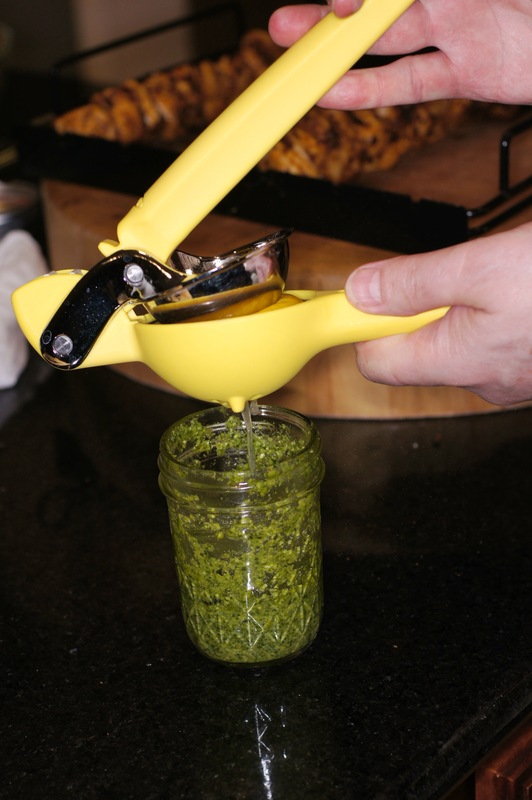 Really odd and it wreaked havoc on my meal planning. 😦 Lately, however, we have been experiencing Spring like weather. In fact, it has the trees fooled if it isn’t Spring. So, this weekend Baby Lady and I diligently worked in the garden. We tilled and weeded and put 3 more yards of fresh soil and compost down. We spread it around and even saved our Swiss Chard plants that are now working on their 5th year with us. Quite a remarkable feat as far as we know. Check it out. So, when it came time for dinner the best way to celebrate the beginning of Spring, even if it is early, is to fix something on the grill. 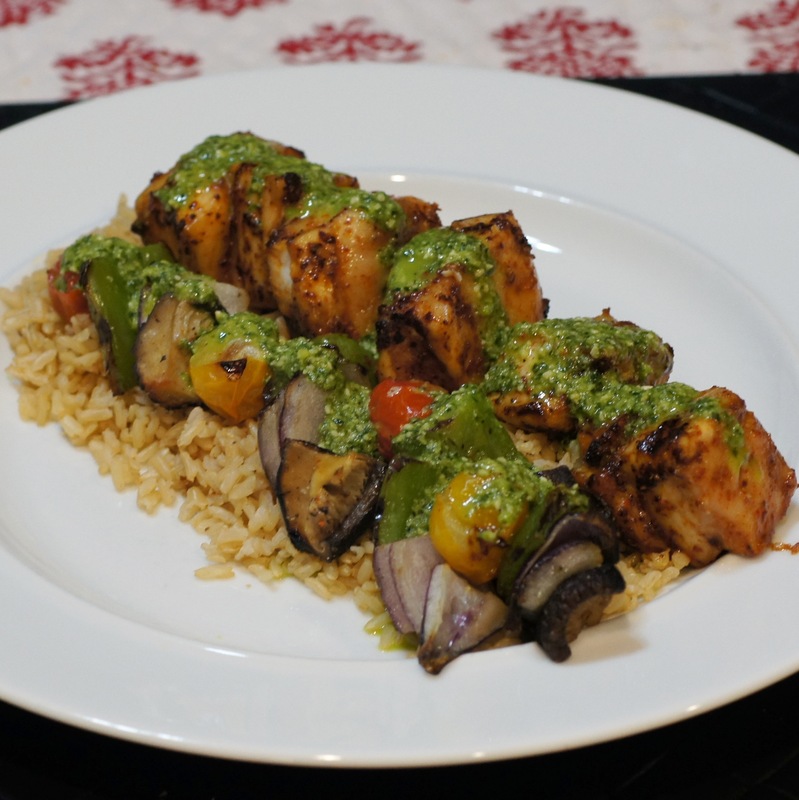 The problem with making fish skewers is the fish cooks considerably faster than the veggies. As a result, you have the option of perfectly cooked fish with raw veggies or overcooked fish with perfectly cooked veggies. We find both of these alternatives completely unacceptable. 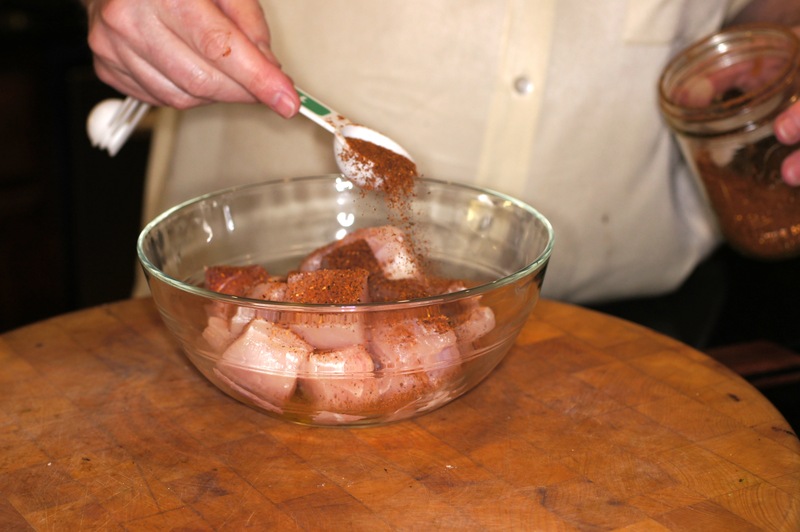 I want the fish perfectly seasoned and cooked with the veggies also done to perfection. I also don’t believe that this is an either/or proposition. In fact I know it not to be true. 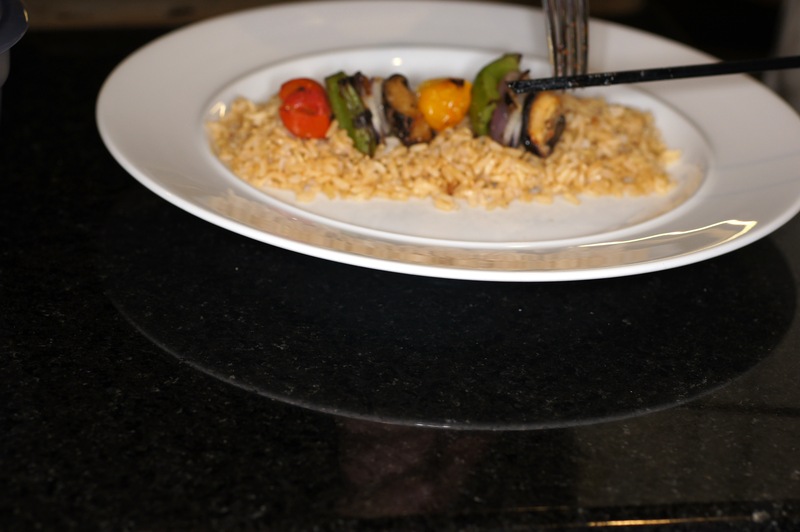 You CAN have the best of all worlds, perfectly cooked fish AND perfectly cooked veggies. 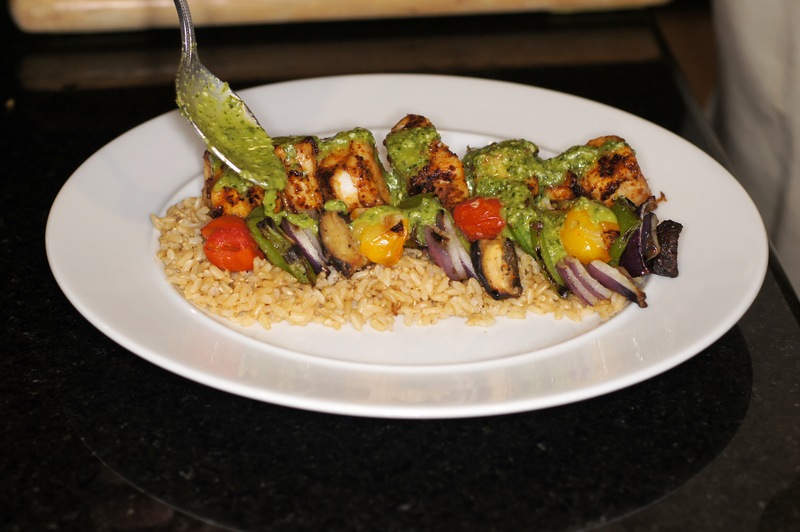 All you need to do is a little planning and don’t cook the fish and the veggies on the same skewers. Don’t believe me? Then give this a try. 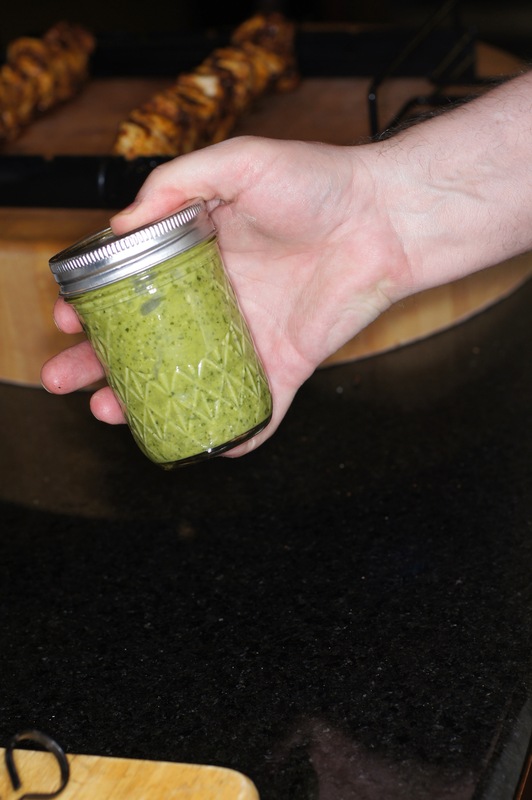 Take 1/2 cup of citrus pesto and add the juice from the Meyer lemon. Shake and set aside until ready to serve. 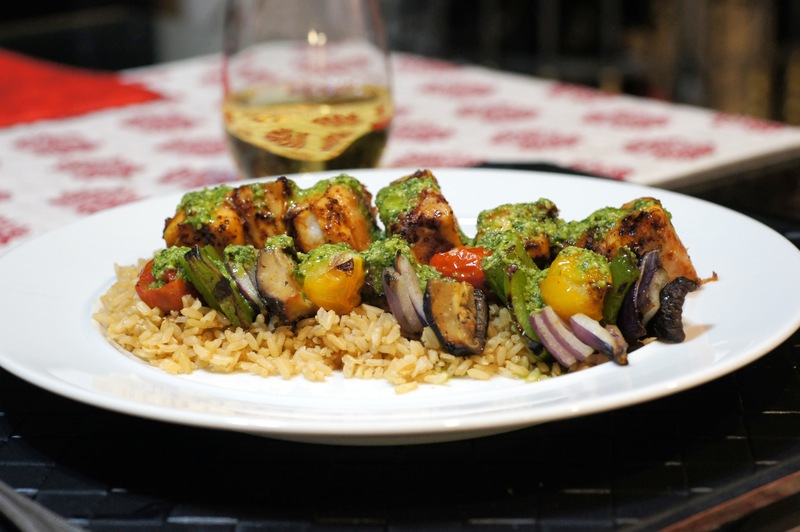 Take skewers to the grill. 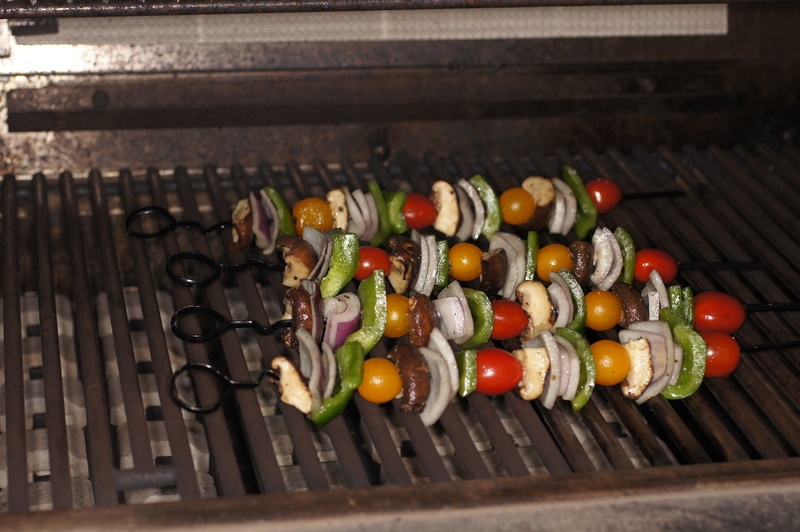 Add the veggie skewers to the grill first on medium to medium-low. 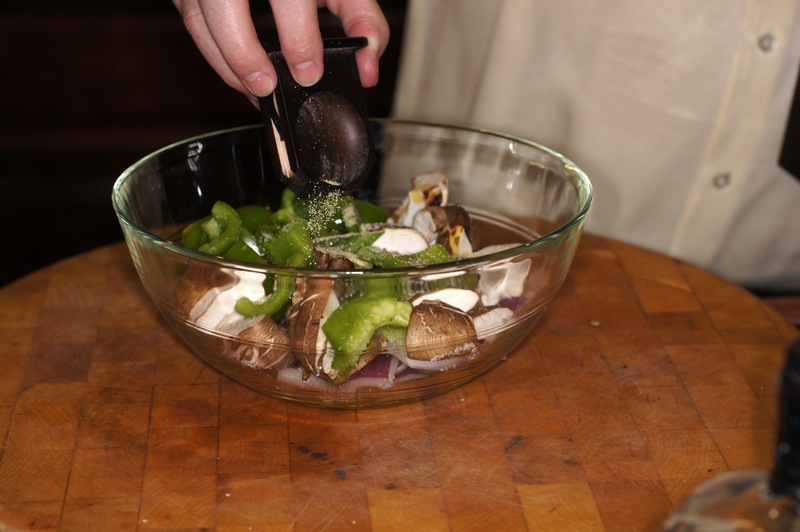 Cook the veggies 1 – 2 minutes, then turn them 90 degrees and cook an additional 1 – 2 minutes. Now place the swordfish on the grill. Cook swordfish for 45 seconds and turn 90 degrees. 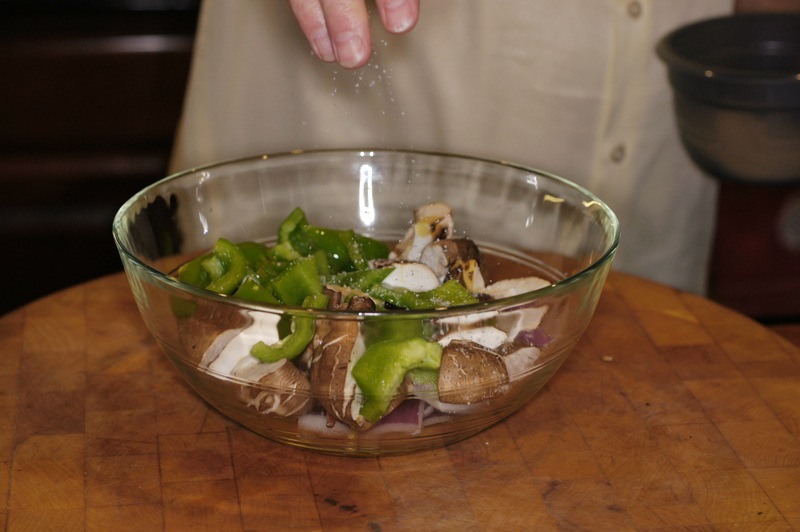 Keep an eye on the veggies and rotate 90 degrees at 1 – 2 minutes. 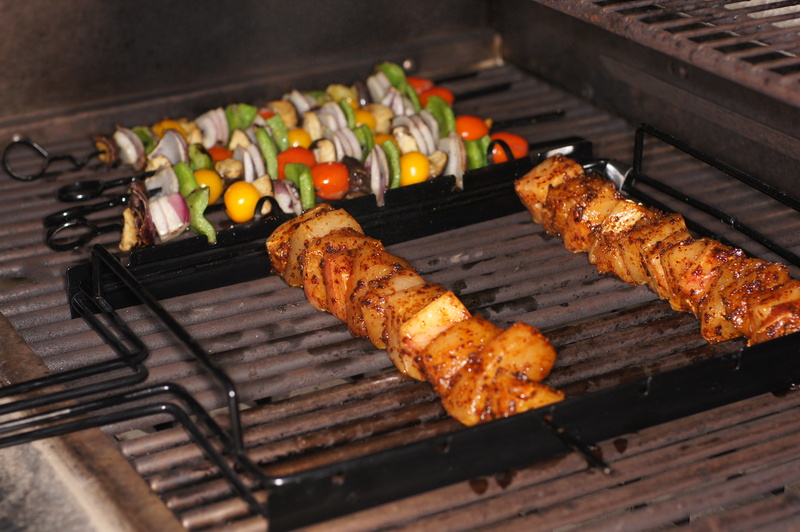 Continue until the swordfish and veggies are cooked. 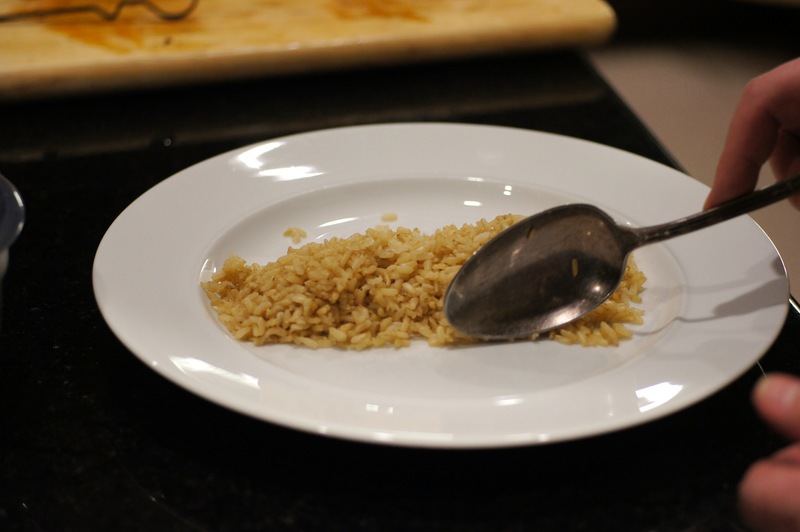 The place some seasoned rice in a line in the middle of a plate. 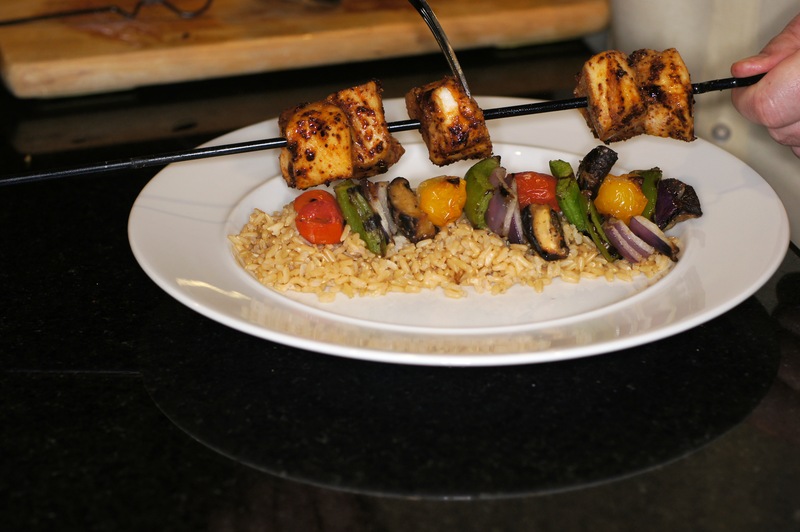 These skewers look fantastic, Richard, and using swordfish here is a good choice. 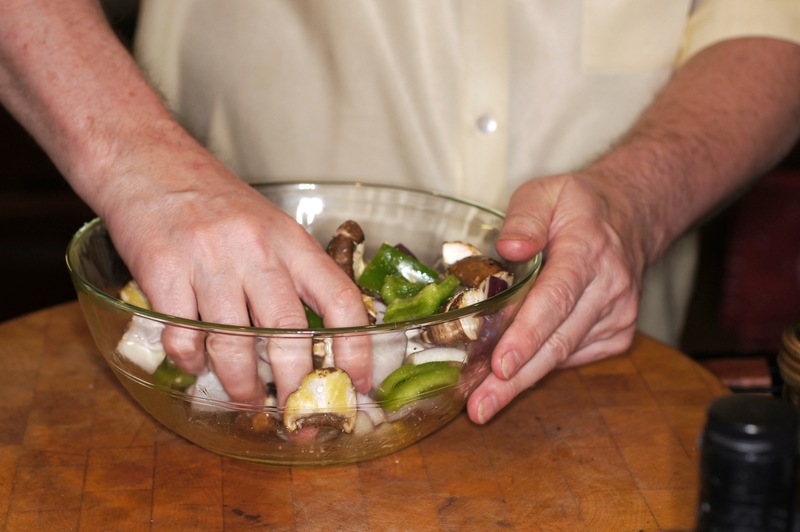 Separating the protein from the vegetables is the only way to insure that all are properly cooked. That last photo of yours says it all. Well done. Thanks, John. It was a great meal with a lot of flavor and pretty quick to fix. We both enjoyed it and working in the garden but we’re pretty stiff and sore today. Weeding, tilling and adding 3 yards of soil is a lot of hard work. What’s with all the pouring shots? I thought we had that one settled. I particularly like the olive oil. A perfect moment in time captured. The whole thing looks excellent. Thanks, Conor. Baby Lady has to help with dinner so she’s responsible for all the prep photos, including pouring shots. She has to make sure they live up to your standards. 😉 That olive oil shot was my favorite, too. Tell Baby Lady to keep up the excellent work. I need someone holding my camera…sigh…I take them all myself one-handed, unless I get the tripod and use the timer. Haven’t done that as of yet. What a beautiful meal. We only had one warm day in Oklahoma where I was able to work outside. 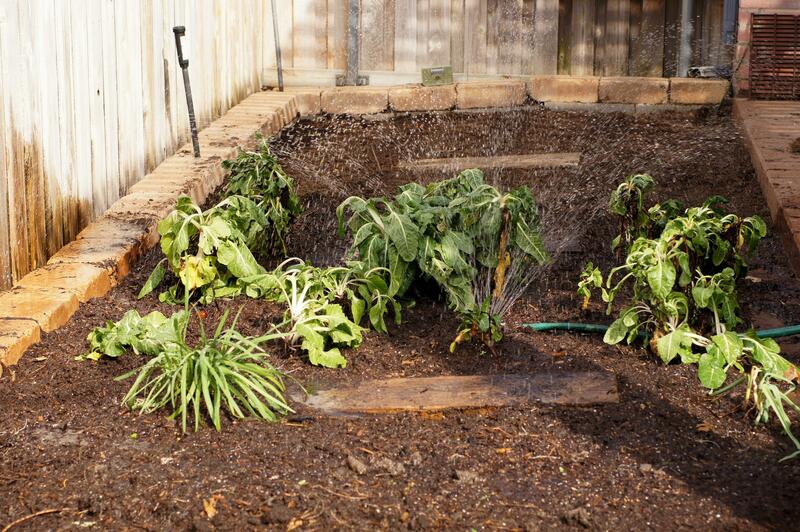 I hope we both have a better summer this year, as you said, the garden “went on life support” last summer! Thanks, Mimi. It was fitting for the weather we had most of last week and throughout the weekend. You guys have had a much harsher summer last year than we did but we hit 80 F in February and again mid-March. This gives me reason for concern and if DFW gets hammered, Oklahoma get hits worse. Where in Oklahoma do you live? The summer before I went to law school I worked in the OK oil patch and lived in Duncan, OK. It was a nice place for a summer. I love to fish at Broken Bow and OKC is the best kept secret around although we hardly ever get up there. Actually, although it would be farther for you, Tulsa is the best kept secret – for art, music, food, and drink. However, since you live in the Dallas-Fort Worth area, you’re not lacking in any restaurants and entertainment. My younger daughter got her first Masters degree at SMU, and it was so much fun visiting her, hitting Northpark Mall, and trying out new restaurants, as well as some of our favorites…. I don’t really have an excuse to go there anymore. Although now, we get to go to London!!! Tasty meal, good post! 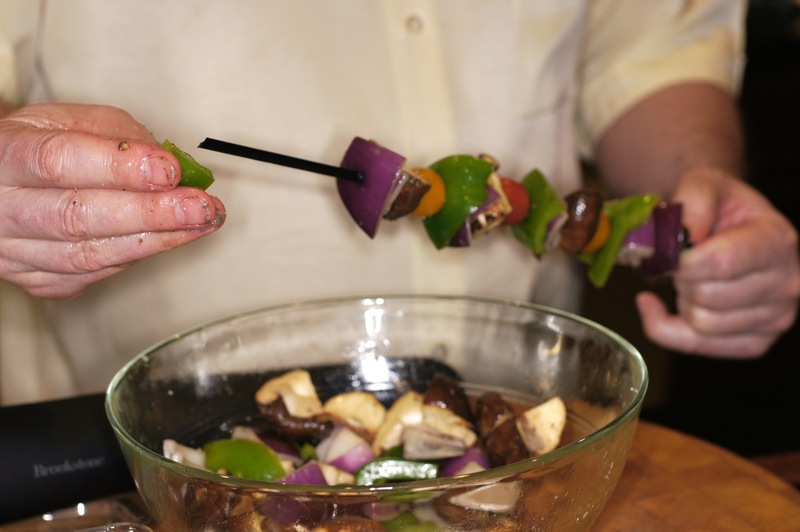 Good idea to skewer veggies and fish separately. Big reason why I’m careful when ordering skewered food at restaurants (also because in most cases meat/fish AND veggies are served charred/burnt). If it gets too hot in July or August you can always flee to Holland. Although this summer it will be hard to catch us at home with all our plans. 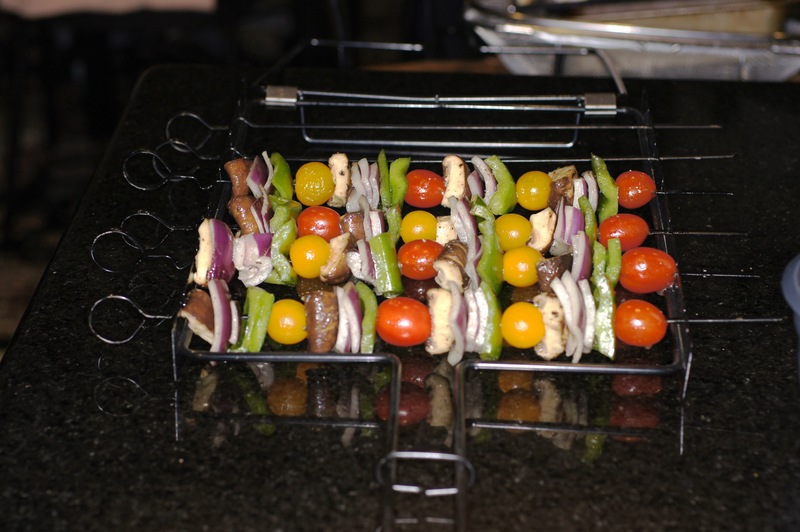 I love grilling–any time of the year–and I love using my skewers! 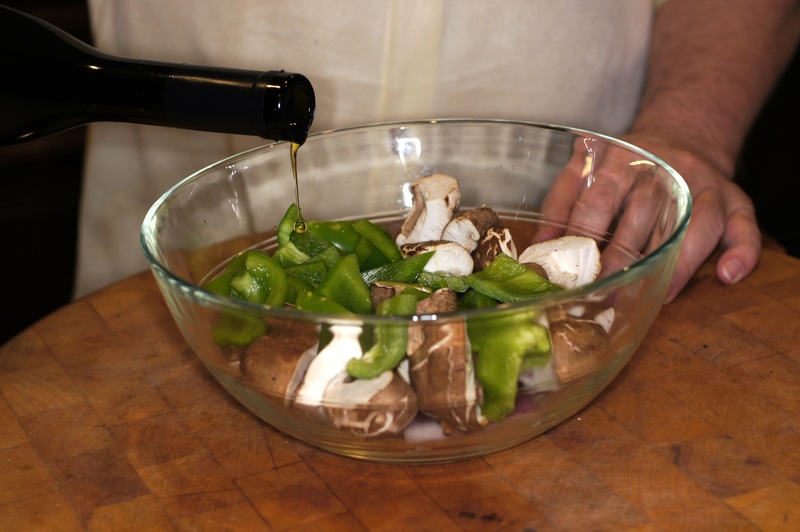 Great recipe and wonderful presentation. I will be giving this one a try very soon. Thanks, Ruby. We’re glad you liked it. Looks like an excellent way to prepare swordfish on the grill. I’m very excited to try this one!